. . . A photograph capturing the four UFO's - which witnesses said hovered in the same spot for more than 10 minutes before simply disappearing - was snapped from Tom Ugly's Bridge Marina just before 5pm. 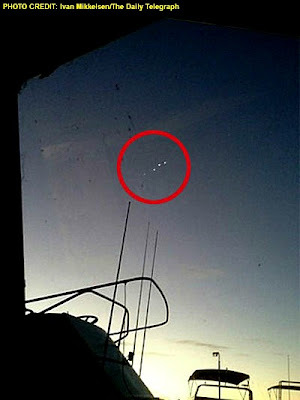 Photographer Ivan Mikkelsen, from nearby Sylvania Waters, said he first noticed the objects through a window on his boat before stepping outside to confirm the unusual objects weren't simply a reflection or a trick of the light. "We just looked up and they were there. They were just sort of hovering there,'' Mr Mikkelsen said. "They were quite high in the air, which is why I thought they might be aeroplanes at first, but they weren't, they didn't move.'' . . .